The Porsche Museum will be presenting the race cars of the brand's successful history again in 2014 as part of the "Rolling Museum" at some of the world's most renowned classic tours. We will of course participate in highlight events such as the Mille Miglia and the Goodwood "Festival of Speed". Key 2014 dates for the historic brand ambassadors have already been set: from May 15 – 18, 2014, the Porsche Museum will participate in the legendary 1,000 miles of the Mille Miglia with an impressive starting field. Competing in the famous endurance road race will be a 550 Spyder, two 356 Coupé and a 356 Speedster. The drivers of these unique vehicles include Dr. Wolfgang Porsche, Chairman of the Supervisory Board of Dr. Ing. h.c. F. Porsche AG, Stuttgart, and racing legend Jacky Ickx. Today, the Mille Miglia is still a challenge for the vehicles and drivers, because the new route covers over 1,750 kilometres in just four days and takes them through a many different weather zones. On June 6 and 7, 2014, the classic race cars of the Porsche Museum will participate in the traditional "Paul Pietsch Classic". Two-time rally world champion Walter Röhrl and Le Mans victor and DTM champion Hans-Joachim Stuck will drive a 911 Carrera 2.7 RS and a 911 Speedster over a 450-kilometre route through southwest Germany. 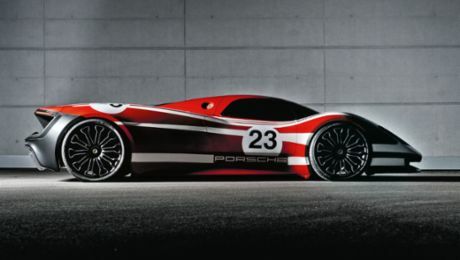 The Goodwood "Festival of Speed" would be inconceivable without a Porsche. This motorsport event, which has been held at the estate of Lord March in West Sussex since 1993, is scheduled for June 26 to 29 this year. The "Festival of Speed" is the world's largest event of its kind. Spectators can look forward to seeing many famous classic Porsche cars. The central theme here is "turbo". Show cars include a Porsche 959 Group B, a 964 Turbo, a 993 Turbo and a Porsche 935, which was known as "Baby" due to its small-size 1.4-litre engine. 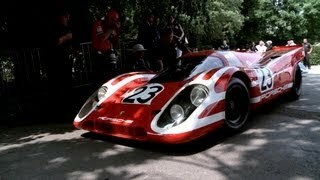 Two special Porsche 917 cars also await visitors: the Porsche 917 KH, which is reminiscent of the first Porsche overall victory at Le Mans and the Porsche 917/30 that was developed for the CanAm race series. To mark the Porsche return to 24-hour endurance racing with the Porsche 919 Hybrid, some famous historic Porsche vehicles will make an appearance at the Le Mans Classic from July 4 to 6. This summer, the Porsche Museum is sending four cars to France: a 911 Carrera RSR Targa Florio, the Group 5 Porsche 935/77 race car, a 911 Turbo Cabriolet and a 911 Turbo 3.0. From July 10 to 12, 2014, the Porsche Museum will send some historic legends to the start of the "Ennstal Classic" that will definitely have a Porsche focus this year. For both drivers and spectators, this multi-day event offers a festival of car driving with a mountain prologue race, tours through the Tauern mountains and a city grand prix event. Along with several Porsche 356 cars, including one that will be driven by Dr. Wolfgang Porsche, there will also be a 911 2.2 Targa. Visitors can admire former race car drivers like Walter Röhrl in a 718 WRS and Jacky Ickx in the legendary 550 A Spyder, as well as current Porsche factory driver Marc Lieb in a GT1’98 at the "Chopard Grand Prix von Gröbming". The Porsche Museum will also be paying a visit to the "6th Schloss Bensberg Classic" with its classic cars. The event is being held in the vicinity of the Grandhotel Schloss Bensberg from July 18 to 20. From August 14 to 17, the museum will be represented at the important automobile exhibition "Pebble Beach – Concours d‘ Elegance" in California. From August 21 to 23, the Porsche Museum is participating in the Saxony Classic. Porsche cars participating in this classic car rally include a 356 Speedster, a 911 Targa and a 911 Turbo, which will be driven around the "Vogtland" region along a 610 km route from Zwickau to Chemnitz.